Ewing – The New Jersey Work Environment Council (WEC) Board is thrilled to announce the formal hiring of Debra Coyle McFadden, a long-time labor-environmental leader and WEC staff member, as WEC’s new Executive Director, effective immediately. Debra joined the staff of WEC in 1997 as a part-time office manager and was the third person WEC hired. Over the last 21 years, she has held numerous positions in the organization that reflected increasing levels of responsibility, including campaign organizer for WEC’s chemical safety and security campaign and staff lead on the Respect Our Right to Know campaign, which ensured that workers and community members have access to information about hazardous and toxic chemicals at industrial facilities around New Jersey. “I look forward to working with Debra Coyle McFadden on issues that are important to refinery and chemical workers of NJ,” stated John Pajak, President, Teamsters Local 877 and WEC Board Member. In 2008, Debra was promoted to Assistant Director. In that role she has been an intricate part of WEC’s senior leadership team and has worked on program and strategic planning, budget and finance, and fundraising. She served in this role while WEC was led by its founding director, Rick Engler, and its second Director, Dan Fatton. “We are thrilled for Debra and this next step forward in the life of this unique organization and the contributions it will make to the well-being of the environment, workers and communities in New Jersey,” said Rev. Fletcher Harper, WEC Board Chair and Executive Director of GreenFaith. She also served as Acting Director on two occasions, following the departure of Engler and Fatton. In every role she has held at WEC, her work has been outstanding and she has had a track record of success. Debra also serves as Treasurer on the National Council for Occupational Safety and Health and is in her third term. I am delighted to welcome Deb Coyle McFadden as the new Executive Director of New Jersey Environment Council. She has proven to be dedicated and resourceful Assistant and Acting Director. She also brings a deep organizational history to the position. 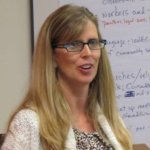 I look forward to working with her as a Board member, as we navigate the future for the organization,” said Elizabeth Smith, Executive Director, Statewide Education Organizing Committee and WEC Board Treasurer. Deb has helped to lead the Jersey Renews clean energy and climate coalition, which NJWEC was a founding member in late 2016, as well as the work of Electrify New Jersey, which is working to expand electrification to all vehicles – cars, trucks, buses and port equipment – across the Garden State. “WEC fills a unique role in bringing together labor and environmental allies to fight for justice for all communities, to ensure that both workers and the environment can win. In these turbulent times, we need organizations like WEC more than ever, and Deb is the exact right woman for this job. She has a track record of success and a commitment to these issues and the organization that is not matched. Now is the time to work united,” said Doug O’Malley, Chair of the WEC Search Committee and the Director of Environment New Jersey. “It is humbling that an organization that I spent most of my adult life working for has now turned to me to lead it. I look forward to continuing to work with my Board of Directors and members as we collectively move the progressive agenda forward in New Jersey.” said Debra Coyle McFadden.